Vajpayee sings Rang De tune! That's what former prime minister Atal Bihari Vajpayee said to film director Rakeysh Mehra after watching Rang de Basanti. Vajpayee was repeating a line from a song in the film. Ready for the Love Quiz? And though it might have struck a chord with the poet in him, the spirit of the movie�-- entertaining and inspirational at the same time, encouraging people to examine their own views on the country today -- seems to have resonated with the general audience too. Rang de Basanti has officially been termed a blockbuster, yet it is not a run-of-the-mill commercial film. "It makes you introspect and point a finger at yourself," says Mehra. The movie tracks the transition of five college-going youngsters. Initially their existence is built around partying; discussions on patriotism and nationalism reveal that they consider them redundant in the new age of consumerism, and freedom fighters and revolutionaries are distant fable-like characters to them. But soon they realise that there is more to life than just fun. The movie juxtaposes the story of the armed revolutionaries of 1930s India with the story of modern India, where the youngsters start absorbing the spirit of the revolutionaries in today's context. With the finale left open-ended, it has kicked up debates and discussions. As the cast of Rang de is being applauded for their performances, the people who were behind the camera are relieved that a complex storyline that could have gone completely wrong came out the way it was visualised. Kamlesh Pandey, who scripted the movie, was researching on Bhagat Singh for television when he came across interesting personality traits of Singh and his friends. "They were young, fun-loving pranksters apart from just being patriotic, which has always been overlooked in other movies," he says. Pandey also found a quote by Bhagat Singh suggesting that independence does not mean replacing white exploiters with Indian exploiters -- and that if that were to happen, he would similarly revolt. With Mehra also keen to do a movie on the armed revolutionaries and both certain that it should not be a period film, they questioned 150 youngsters in a focus group on their views on India today. Their revelations were the same as depicted in the movie -- hedonistic, confused, cynical and indifferent. Mehra and Pandey then knew they had a story. "If you have to contemporarise patriotism, you have to do it with an issue that is relevant like the MiG issue. The characters in the movie, like the audience, are cynical about such issues and therefore relate to the movie," says Rensil D'Silva, who co-wrote the screenplay with Mehra. D'Silva ended up doing 22 drafts for the screenplay, careful to make it a youth movie, run a parallel story and yet not make it preachy or theatrical. From debating on heavy titles like 'Aahooti' (sacrifice) and 'Young Guns Of India', it was finally the lighthearted Rang de Basanti they homed in on -- the lines being from a song that Bhagat Singh liked. With Aamir Khan all for the movie, "it made a lot of things fall into place", says Mehra. Khan's maturity in sharing the stage with young actors -- who all gave brilliant performances --�is being lauded by the film industry. The spontaneity and camaraderie of the college friends is effective and D'Silva admits that a screenplay with nine central characters in two different time periods and sets was a daunting task. No wonder Rang de's screenplay took three-and-a-half years to complete even if the shooting was completed between February and July last year. "A complex, non-linear movie of this canvas is a dream for any producer," says Ronnie Screwvala, CEO, UTV Productions who is gratified by the astounding commercial success of the movie -- it grossed Rs 44.78 crore worldwide in the first 10 days itself, something no one expected. Also, UTV spent a whopping 40 per cent (Rs 10 crore or Rs 100 million) of the total movie production costs (Rs 25 crore or Rs 250 million) for its promotions. "If you don't want to spend on marketing, don't make the movie," asserts Screwvala. With the movie's now-popular lingo being exactly campus-like with slang and casually used abuses, Prasoon Joshi, head of McCann Ericksson, Southeast Asia, who isolated himself in Goa to write the dialogues and lyrics, did contemplate upon its usage but then decided "to be honest to the language". The on-spot sound recording by Nakul Kamte while shooting also retained the spontaneity of the dialogues. Joshi recalls the biggest challenge while writing the dialogues was to get into the groove of the movie, while not becoming nostalgic about his own young days. "The boys' transition had to be subtle where their dialogues were not to be forced but are forceful," says Joshi. Rang de's script and the creative freedom shown by its director led A R Rahman to leave his Lord Of The Rings project halfway in Canada and compose nine soundtracks for the movie -- uncommon for a Bollywood film these days. 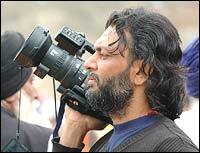 Binod Pradhan, its cinematographer, let go of two projects, leaving one halfway to be part of the project. As creative producer and editor for the movie, Bharati Mehra's choice for hard rock music as the background score for the sepia-toned scenes of the armed revolutionaries was to make "even those revolutionaries like youngsters". Rakeysh Mehra adds, "We didn't want to put a halo around them." And even if the movie's ending invokes criticism by some, it makes a statement. "To be discussed by people in a caf� means it has struck a chord somewhere," says D'Silva. Right now, as Rang de runs to house-full shows, Mehra has only one thing on his mind -- to make it tax free. "We've made enough money, people from the lower income groups also should get to see it," he says. It's obvious that he's overwhelmed by the response, and content that his seven-year project conveyed what he wanted to say in the right way -- while still managing to be entertaining.